Would the Boston Globe prefer violence in Egypt? One of the turning points of this year’s Egyptian revolution was the televised interview with Wael Ghonim, the Google executive who helped launch the movement. “It is not given to man to know the whole Truth,” he said, fighting back tears. “His duty lies in living up to the truth as he sees it, and in doing so, to resort to the purest means, i.e., to nonviolence.” By largely relying on nonviolent methods, the Egyptian people won the admiration of the world and a newfound sense of self-respect. But were Ghonim and his compatriots mistaken? In an article published in the Boston Globe this past weekend, Thanassis Cambanis insinuates—through interviews with often-unnamed “core activists” in Egypt—that not only was the movement that brought down Mubarak more violent than most believe, but that by continuing to hold firm to nonviolence, the pro-democracy movement is shooting itself in the foot. Among the dedicated core of Egyptian street activists who have been at the forefront of the protests since the beginning, an increasing number have begun to argue that a regime steeped in violence will respond only to force. Egypt’s revolution appeared nonviolent, they argue, only because it wasn’t a revolution at all: it was a quiet military coup that followed the resignation of the president. They cast a glance at nearby Syria and Libya, still racked by sustained violent revolts against their authoritarian leaders, and wonder if that may be what a true revolution looks like. Leftist political thinkers have turned to the history of the French and Russian Revolutions to argue that a full break from Egypt’s authoritarian past will ultimately require the use of force against the regime. Rank-and-file activists in Tahrir Square invoke a more visceral rule of power, pointing out that riot troops and secret police agents will yield only to the raw strength of popular confrontation. To bolster his case, Cambanis goes on to quote several Egyptians who are frustrated with the pace of change and are calling for violence and revenge. As Joe Gabra, a “rank-and-file” member of the April 6 Movement, told him: “We need to take up arms… If you get shot at, this peaceful stuff doesn’t work.” According to the article, Gabra is not alone, but part of a “persistent chorus” calling for violence as the best path to democracy. Even more shockingly, Cambanis then discounts the effectiveness of nonviolence throughout history—by referring to the recent nonviolent movements that overthrew governments in Eastern Europe, the Philippines and elsewhere as either “soft” or “gentle” revolutions that were largely ineffectual and perhaps “exceptions rather than the rule.” To him, this suggests that violence is an essential element of any revolution worthy of the name. The problems with his analysis are so staggering that it’s hard to know where to begin. 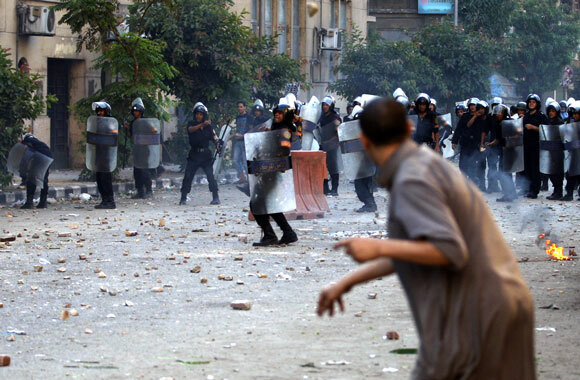 First, of course, there was violence in the Egyptian uprising. No one can say that it was entirely nonviolent. The more important question to ask, though, is what the deciding factor was for Mubarak stepping down. Did the throwing of “rocks and Molotov cocktails” by Egyptian youth overpower the riot police, long before the ouster, as the Egyptians that Cambanis interviews say? Or was it the fact that millions peacefully took to the streets for nearly three weeks, and that a crippling general strike was spreading across the country during Mubarak’s final days? There is simply no good evidence to back up the claim that the violence of the protesters was decisive and somehow scared the highly-capable Egyptian military into giving in to their demands. On the contrary, the moments when protesters resorted to violence were those when they came closest to losing control. What made the movement powerful was that most people in Tahrir Square and throughout Egypt faced violence without responding in kind, and this discipline was key to their success. If more people had responded with violence, the death toll of the revolution would have been dramatically higher, and Mubarak may very well have prevailed. Just think of Libya. Second, the notion that “a regime steeped in violence will respond only to force,” or that “riot troops and secret police agents will yield only to the raw strength of popular confrontation”—by which he means violence—is demonstrably false. Mubarak’s regime and his security apparatus did in fact yield to peaceful protest, and there are many examples of ruthless regimes throughout history—from Pinochet in Chile and Marcos in the Philippines, to Milosevic in Serbia and the apartheid regime in South Africa—that did the same. While in each of these countries the struggle for social and economic justice is far from over, the overthrow of these regimes was an enormous step in the right direction. Third, the claim that only violence can effect a “true break from the past” and remake an entire state is also blatantly untrue. As Cambanis points out, this was the result of the Iranian revolution in 1979—which, rather than being violent, as he claims, was one of the largest nonviolent movements in the 20th century. Millions of Iranians participated in mass demonstrations, strikes and boycotts that eventually forced the Shah from power. [T]he American Revolution retained the basic system of white male property owner power and privilege, so even the use of violence doesn’t change the real conditions much for those at the bottom… Nonviolent improvements on American democracy—women’s suffrage, legalization of unions, the Civil Rights Act, the Voting Rights Act, Americans with Disabilities Act—all these were essentially won with nonviolent struggle often even more widespread than the proportions actually involved in the Russian Revolution, and all extended more rights to more groups of people. Even when violence does effect sweeping changes, as Hannah Arendt wrote, “the most probable change is [to] a more violent world.” Would anyone at this point really recommend the French or Russian Revolutions as models to be followed? [N]either Pape nor Arreguín-Toft compares the effectiveness of violence with that of nonviolence or “peaceful means.” Pape’s 1996 book, Bombing to Win, compared the use of aerial bombing compared with conventional types of interstate military conflict. His 2005 book, Dying to Win: The Strategic Logic of Suicide Terrorism, argued that suicide terrorism campaigns tend to succeed when they target democratic regimes that are occupying foreign territories with different religious orientations. In his book, How the Weak Win Wars, Ivan Arreguín-Toft looked at how the use of unconventional methods of conflict–such as guerrilla warfare–could succeed against militarily superior opponents who resorted to conventional battle techniques (he also argues that states can use “barbarism” to be victorious over weaker opponents using guerrilla warfare). However, his study is limited to inter-state conflict. Neither of these scholars is comparing the effectiveness of violence with nonviolent resistance. Contrary to Cambanis’s argument, the historical record reveals rather dramatically that nonviolent resistance is strategically superior, and, in the end, often leads to much more democratic and stable societies than violent insurgency. Although Egyptians may be rightly frustrated with the pace and direction of the transition, they need only look to other recent cases—such as Libya or Yemen—to see the risks of using violence to attempt to improve their strategic positions. Our research indicates that if Egyptians resort to violence, their chances of success will drop by about half, the risk of civil war will steeply rise, and the chances for democracy in the foreseeable future will be considerably reduced. Cambanis makes a daring argument, one likely to raise curious eyebrows in Boston. But by relying on stray interviews and a poor grasp of the most relevant research, for the people of Egypt and those fighting to free themselves from oppression elsewhere, his story is plainly irresponsible, even dangerous. Thanks Tom. I liked your response as well. Very helpful. And I agree with you about the word “daring”. It was a poor word choice. I’ll pile on my thanks to you too, Tom, for your timely post. If only we had your dispatch!